My name is Louise Gavaghan and I was awarded the JP McManus All Ireland Scholarship after completing my Leaving Certificate in St. Attracta’s Community School Tubbercurry Co.Sligo in 2009. I went on to study Pharmacy in Trinity College Dublin, which had been a life long dream. 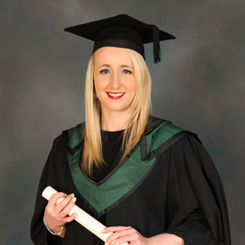 I completed my studies in Trinity in 2013 after receiving my B. Sc (Pharm) and am now studying in RCSI for my M.Pharm which will allow me to qualify as a pharmacist and register with the Pharmaceutical Society of Ireland. During my time in Trinity, I was awarded a number of prizes for my academic merit. I was awarded the Entrance Exhibition Scholarship in 2009 on the basis of my Leaving Certificate results. In 2013 I was awarded the Alumni Prize for achieving the highest overall results in the Junior Sophister annual pharmacy exams. I graduated from Trinity with a first class honours in Pharmacy and was awarded the Sanofi Prize in Pharmacognosy, the Pfizer Healthcare Ltd Prize in Pharmacology and the Actavis Academy Senior Sophister Pharmacy Prize for achieving the highest overall mark in the B.Sc. (Pharm) degree. At my graduation, I was also presented with the prestigious Board of Trinity Gold medal for my achievements. The JP McManus Scholarship enabled me to focus on my studies and achieve my goals which would have been a struggle without the generosity of this much appreciated award. I must thank JP McManus for considering me for such a significant scholarship and acknowledge his input into the education of so many young individuals in Ireland. It has encouraged me to work hard and to strive to succeed this lifelong dream.